Jesus tells the parable of the ten virgins to highlight the importance of adopting a mind-set that looks forward to the coming of Christ’s kingdom with diligent anticipation. If we truly long for something, we ought to be ready when it finally transpires. Our faith that it will occur is reflected in this posture of readiness. And nothing provides evidence of that “ready posture” like a continual willingness and ability to serve Christ (the bridegroom) wherever we encounter Him. The bridegroom’s rejection of the foolish virgins may strike us as graceless and unforgiving. But we should not take the five women barred from the wedding feast and blame their misfortune on mere imprudence. Rather, we should see in their “unreadiness” a lackadaisical attitude toward the promises of God. The Bridegroom has announced His intent to return. Our actions–indeed, everything about us–should gratefully resound with the hope we have in the One who will fulfill that promise. Jesus reinforces this message in the parable of the talents. Here, two servants maintain an attitude of diligent readiness while they await the return of their master. Given responsibility over a portion of the master’s wealth, they commit themselves to the master’s gain and go on to enjoy the master’s reward. In contrast to his fellows, the third servant squanders the opportunity afforded to him and proves unready when the time for accounting comes. On the surface, we can muster some sympathy for this hapless servant. At worst, he may strike us as lazy. If we’re charitable, we might label him as just a bit too risk-averse. In any case, we can accept the fear he has of his master as a plausible excuse for the inaction that results in his harsh punishment. Yet while we tend to think that this third servant is afflicted by fear, he seems–on closer inspection–to be driven more by selfishness. Consider how the “one-talent” servant explains his poor performance and then tries to make amends. The underlying logic reveals a thing or two about how he thinks about ownership. His perspective on what rightfully belongs to his master and what he can justifiably claim for himself severely distorts the master-servant relationship. He sees only the one talent at play here. It’s all he’s been given, so it must be all he owes. Once he returns it, they’re even-steven. But there is much more to this transaction. It is not enough to hand back the one talent with some subtle appeal to a pseudo-silver lining (“well, at least I didn’t lose any money”). Why is this not enough? Because the master’s claim over the servant extends far beyond a single talent. It encompasses the servant’s entire life and livelihood . . . everything the servant possesses . . . everything about him. Having entrusted this servant with a portion of his wealth, the master now expects a return on investment commensurate with the servant’s abilities, which (we might presume) had been acquired and refined under the master’s charge. Instead, the master gains nothing . . . just a hole in the ground. When the servant indirectly accuses the master of “reaping where he has not sown,” he is saying that the master habitually takes what does not belong to him. We need not accept the servant’s statement as a fair and accurate judgment. The problem lies not with an abusive master but with an envious, selfish servant whose hard heart has blinded him to the master’s true character. It’s not a case of the master greedily overstepping his bounds. In the servant’s world, there are no limits to the master’s authority. Again, everything belongs to the master. It is the servant, rather, who implicitly claims something that is not his to claim. Forget about the talent . . . his very life is not his own. Are we living in joyful expectation of the promise, tending to the Master’s business and thus ready to welcome the Master when He returns? As servants, how do we view the life we have been given? Do we compartmentalize . . . setting aside one talent as a peace offering to the Master while clinging to a string of passing days that we imagine to be our own? Are we afraid to let go of that life, hiding behind a mask of fear but really stewing–as the wicked servant does–in a tepid pool of selfishness? We don’t have to be. By His grace, we can have a heart that is truly ready to hear those words. 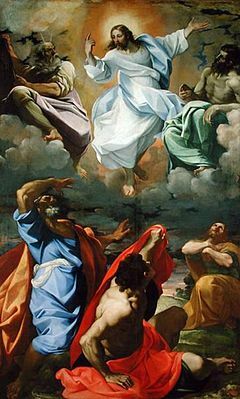 Atop the mountain, Peter, James, and John witnessed the transfiguration of Jesus and then made the mistake of ascribing to the Savior-King and Son of God a status on par with the law-giver Moses and the prophet Elijah. God the Father interrupted while the well-meant but offending words lingered on Peter’s lips. The voice cut swiftly from the looming cloud, dazzling the disciples with its truth. Their hearts numbed in holy terror, Peter, James, and John crumpled to the ground and buried their faces in the folds of the mountain. Like mice nosed up to a dark corner, they tried to avoid the lightning and thunder of God by seeking shelter in the quaking crooks of their elbows. Thankfully, there was no escape. The moment of trembling passed as the Savior came into their darkness and restored them. He reached down and conveyed assurance. He spoke and bid them “rise, and have no fear.” Upon lifting their eyes, Peter, James, and John “saw no one but Jesus only.” The King stood alone in His glory yet stooped to comfort the afflicted . . . by sight, sound, and touch. Even alongside Moses and Elijah, Christ alone is worthy and deserving of our worship: the Grace come to fulfill the Law . . . the One to whom the prophets pointed.